Discussion in 'General' started by armad, Aug 18, 2016. Nཛ͢ཀཇཧ༏ཧי ... .... .- .. -. Have you tried Mr Wright's paint saver? cdogg556, chubs and armad like this. Shannon? A vendor on this site? Mr Wright and Shannon one of the same? Contact info. I'm here Armad. I'll PM you my number and you can give me a call. Thanks, I will check this out. Did it stop the paint bubbling too? Shannon is the man i have mine on for a little over a year and no problems. I put one from Shannon on my buddies K9, works great and looks good. How'd does that bad boy go on? Those Allen heads are just for looks right? I'm assuming it's a pop up deal? Looks bitchin! cdogg556 and chubs like this. It screws in just like the paint saver does, you remove 2 of the screws and insert the brass standoff's to tighten it and then remove them and reinsert the screws, the screws do not touch the tank and you can see the cap screws off with the black part in the pic. Did you set it in epoxy or anything. That looks good. Hell no, I had my fill of epoxy, I tried putting chemical resistant epoxy on around the edge of the paint on the bare tank and the gas made it gummy even after I left it set for 3 days before installing. So all I did was to remove the gummy epoxy and sealed the paint edge with a few layers of clear and installed it with the rubber gasket that came with the cap. You can see the vent hole in the cap, the brass screw is pointing at the vent hole in the cap and since that is recessed into the paint savor when the cap is in place, the vapors evaporate. With the OEM cap, every time I put gas in it, I could see the liquid under the cap which eventually wicked around under the paint savor. I removed the paint saver today. It went good and came out easily. Only problem was I had to cut back more than I would like to get rid of the bubbled paint. There seemed to be some filler up by the opening. I will have to seal this up somehow. It ended up being about 2 3/4 in. across. 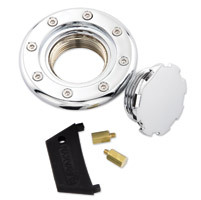 I ordered the Kuryakn flush cap 8309, I hope it will cover the whole area.